Foxgloves are definitely a sign of Summer for me. 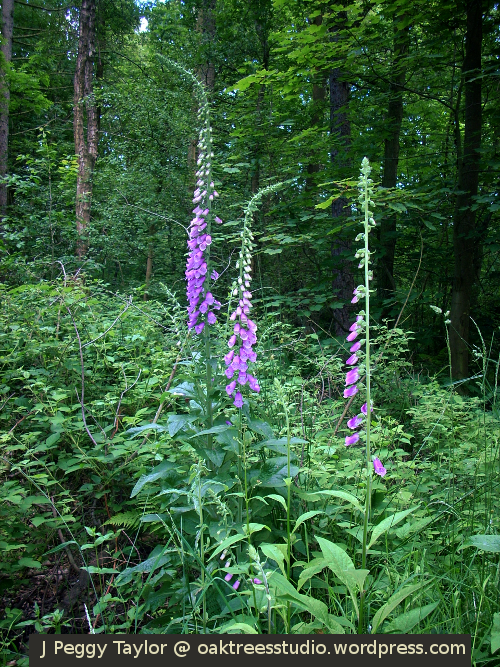 I love their spikes of purple flowers against the rich Summer greens of the woodland. 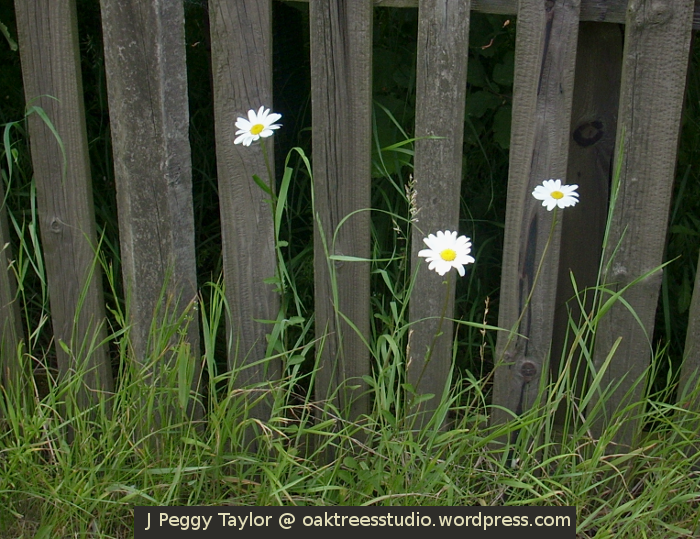 These three ox-eye daisies looked much lovelier than I have managed to captured in my photo! Their sunny faces were looking up at me from beside this wooden fence. The object of our walk today was to see the wild poppies flowering along the field edges. I’d planned to take more photos but the breeze had picked up again, which was better for walking uphill on a rather warm day, but was not so good for photographing poppies! 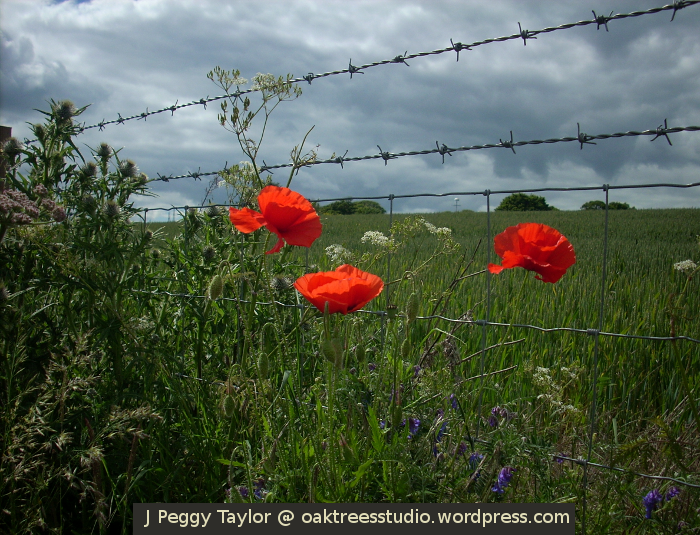 Never mind – the poppies danced for us in the breeze instead, which was still lovely to see. Do take a look at what others have found in groups of three for Cee’s Fun Foto Challenge this week. There is no better time to enjoy the beauty of our woods than after a spell of Summer rain. The new season’s greenery is washed clean and refreshed. 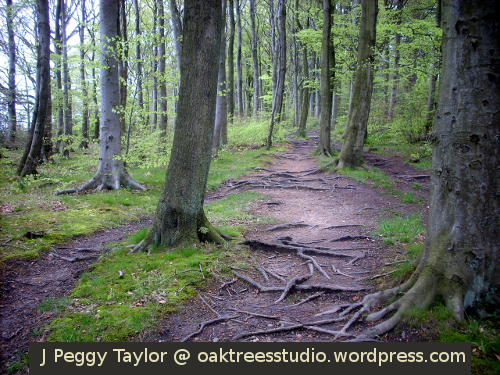 The dark, wet tree trunks contrast strongly with the bright greens of early Summer leaves. 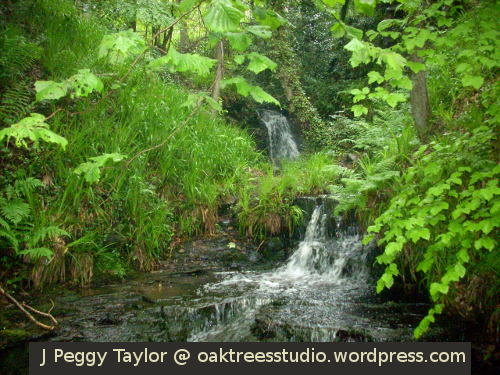 The air is laden with the delicious earthy scents of damp woodland, mingled with the fragrance of ‘green’. Did you know you could smell ‘green’? 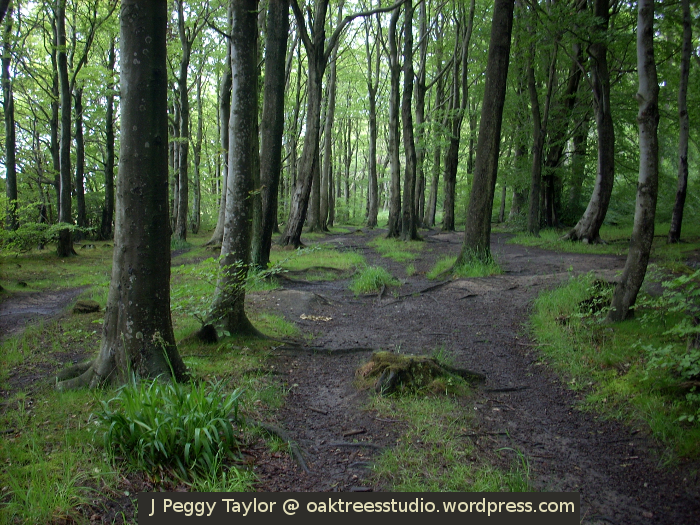 In damp woodlands in June, I am sure you can. 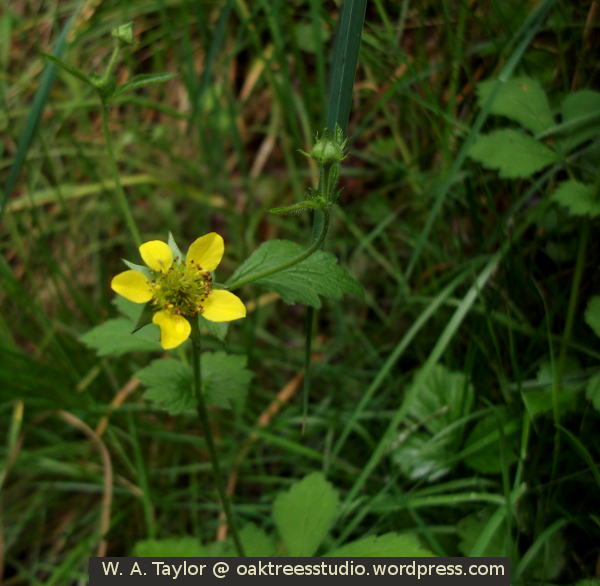 As well as enjoying the woods and their glories generally, on this occasion I was watching out for one particular woodland flower, the Wood Avens Geum urbanum (also known as Herb Bennet). Last week, when I was giving you the answers to my fun plant quiz, I discovered that somehow I did not have any photographs of this very common woodland flower. 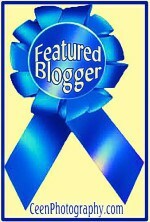 Hopefully, we would be able to rectify this situation. 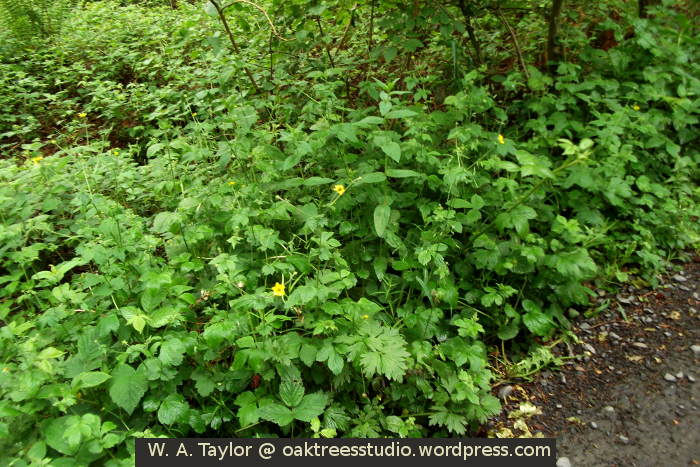 Soon after entering the woods, we were spotting Wood Avens growing beside the woodland paths. Their delicate yellow flowers dotted the path-side greenery. 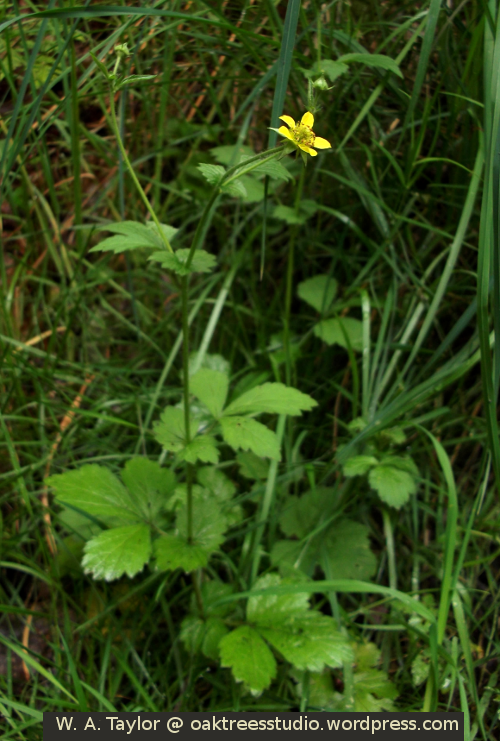 Here you can see the Wood Avens plant, nestled in amongst the grasses with its bright yellow flower. Here’s a closer look at the Wood Avens flower. The yellow petals are very fragile and look as if they may blow away at any moment. 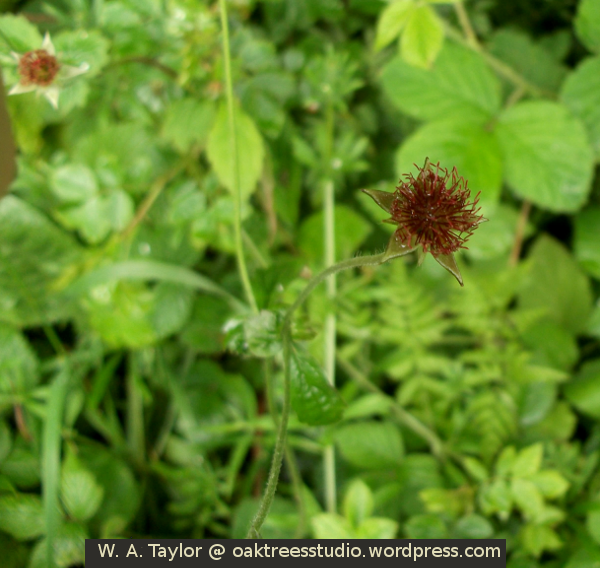 The Wood Avens flower only lasts a brief time before the red hooked seedhead develops. The seedheads are rather more robust and will stay around across the Summer. The hooks of the ripe seeds would enable them to hitch a ride on a passing animal and so spread the flower seeds further. With the Nine Arches Viaduct, in Gateshead’s stretch of the Derwent Valley, it is possible to answer my question definitively. 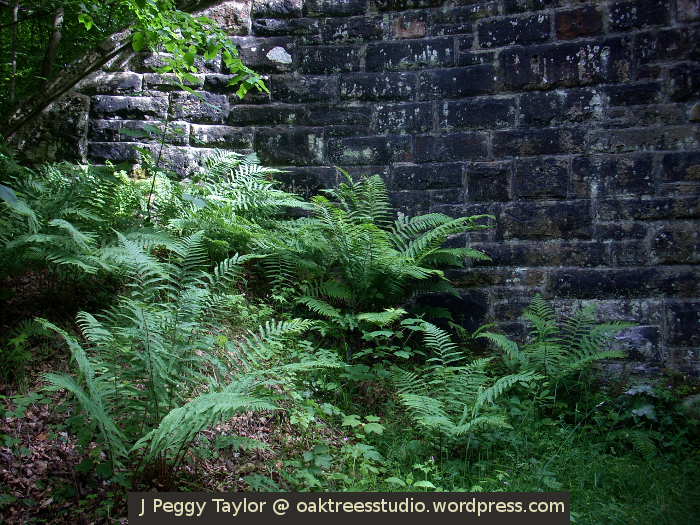 When the Derwent Valley Railway was built in the 1860s, the Earl of Strathmore refused to allow the railway to cross his land on the south side of the river and this meant two sizeable viaducts were needed to route the railway onto the north side to avoid the Earl’s Gibside Estate. I can appreciate that to keep the railway on a level route would have taken the railway rather close to the grand Georgian house and besides, the Earl’s coal interests didn’t require this railway line, so why would he help out his competitors?! Arguments of this sort were commonplace as Victorian coal mine owners sought routes to transport their coal to the River Tyne and so increase their fortunes. 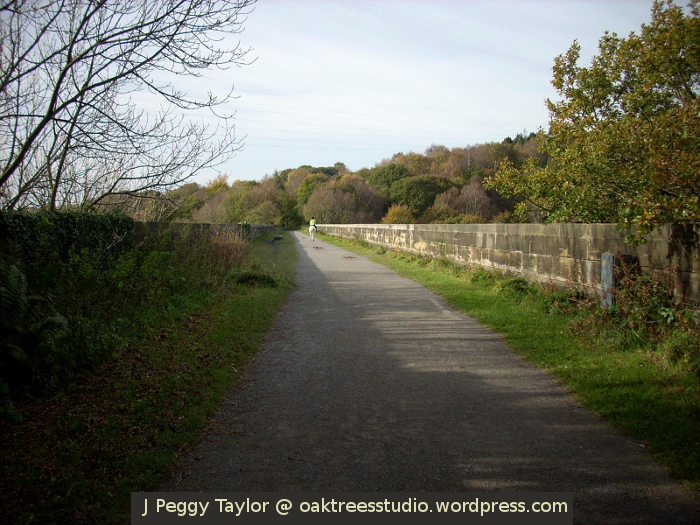 The Nine Arches Viaduct now carries the Derwent Walk Railway Path, a multi-user route that is very popular for walking, cycling and horse-riding. This route is part of the C2C long distance trail between the east and west coasts of England. Many people must travel over the rather unassuming concrete surface of the viaduct without ever knowing the reason for its existence and those who never venture from the main path down to the river bank would also never know the huge scale of this amazing piece of Victorian engineering, 500 feet (152 metres) long and rising 80 feet (24 metres) above the River Derwent. As you’ve probably guessed, the viaduct is known as the “Nine Arches” because it has nine arches, though only one of them actually spans the River Derwent. Looking up from the meadow and the river bank is the best place to see the impressive scale of this sandstone and brick bridge structure. 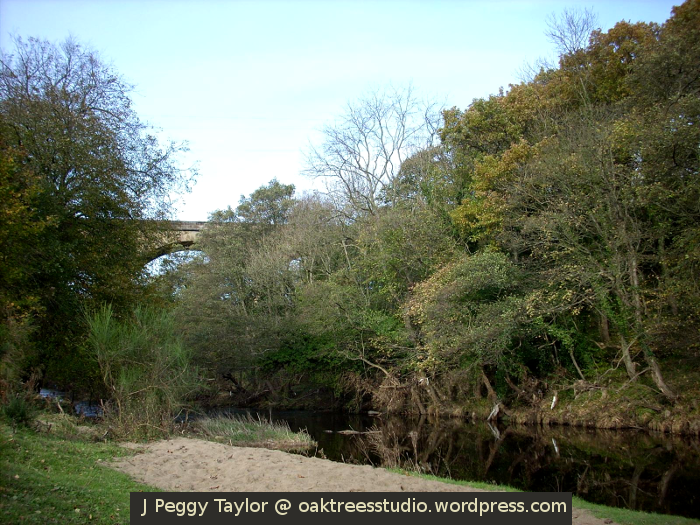 The fence under the trees and the trees themselves in the above image give you some idea of the height of the railway viaduct. Now let’s take a look at the Nine Arches Viaduct from an elevated viewpoint. 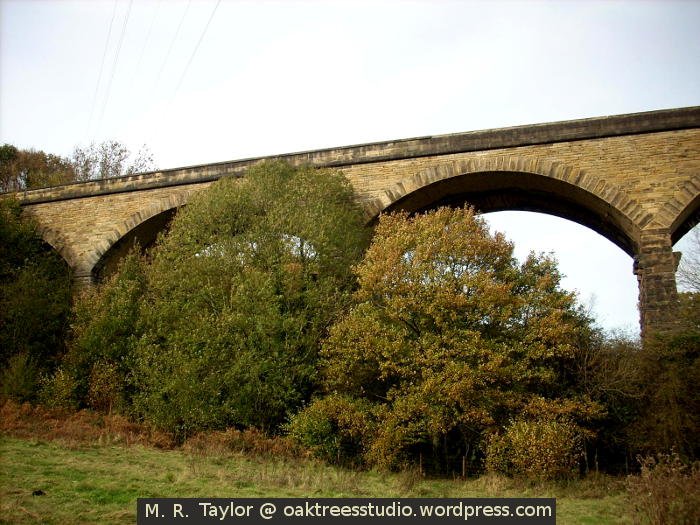 Here we can see the Nine Arches Viaduct in context. You can see it is dwarfed by its own landscape setting, taking its small-scale place in this wooded valley. 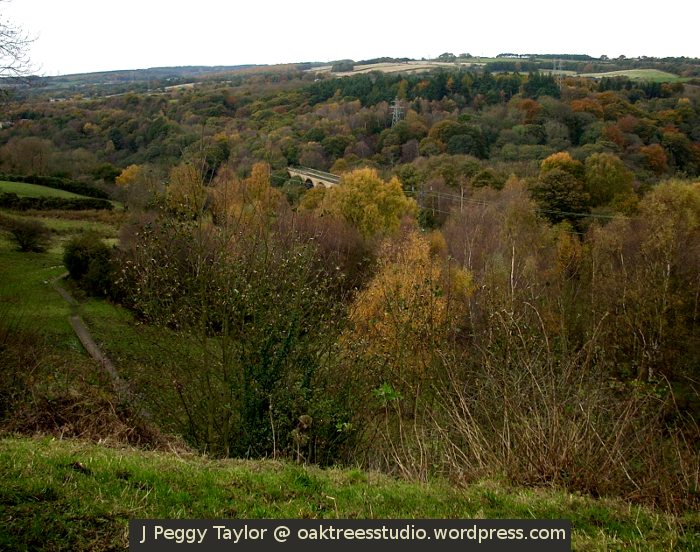 I think the view over this part of the Derwent valley is wonderful when the woodland is in its Autumn colours. 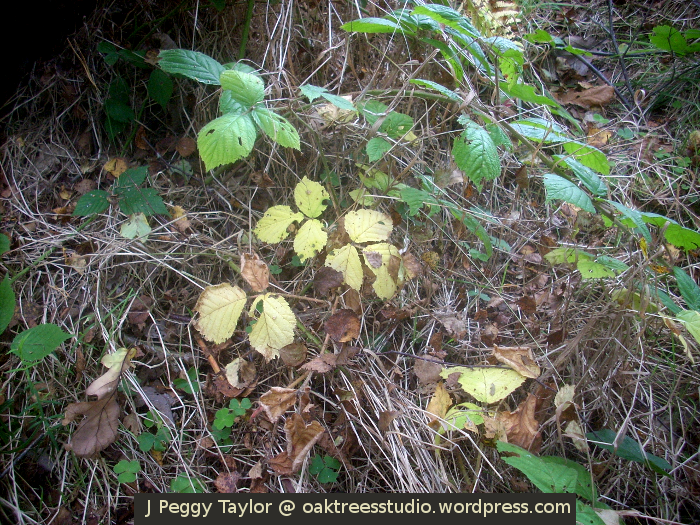 After my surprise and delight at being selected by Cee as one of her Featured Bloggers for my post in last week’s Fun Foto Challenge on the colour blue, this week I have looked for yellow signs of Autumn in my favourite environment, the woods. 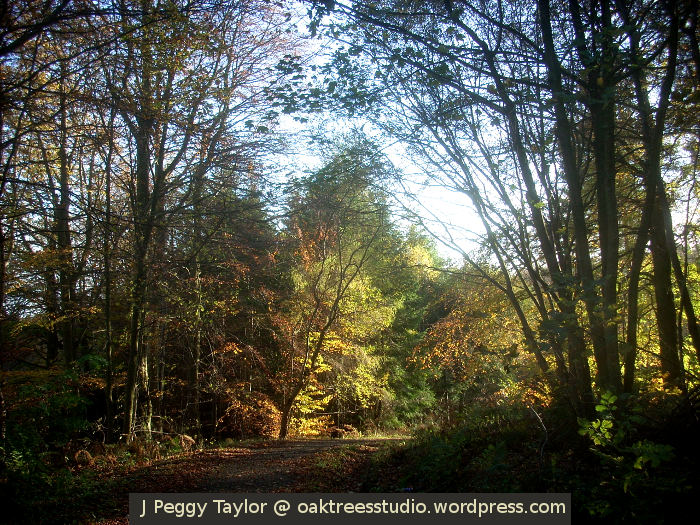 When we took a Sunday stroll in one of our local woods last weekend, we could certainly see Autumn is upon us. 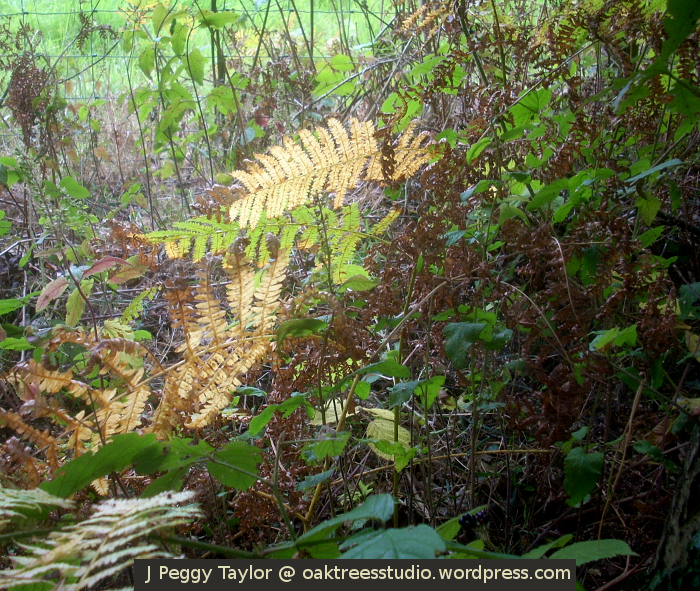 Yellowing bracken and yellowing leaves were all around us. The Autumn leaf colours that we all so enjoy are a very visible sign that the trees and plants have done their work and are approaching their Winter’s rest. The changing colour we observe is part of the chemical process in the leaves that we know as photosynthesis. The lower levels of sunlight and cooler temperatures of Autumn mean the leaves are no longer able to produce chlorophyll, the pigment that paints the leaves green in Spring and Summer. As the chlorophyll is used up by the leaf for food and the leaf is no longer able to produce more, we observe the green of the leaf fading to yellow. The yellow colour is provided by the carotene that has also been present in the leaf but in Spring and Summer is not visible to us under the green cloak of the chlorophyll. We learned all this and more on the changing colours of Autumn leaves from this fascinating Woodland Trust information leaflet. 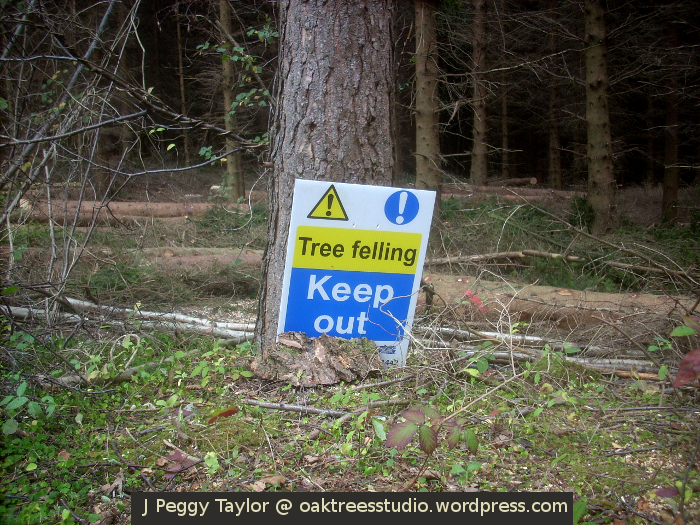 The signs of the approaching time of rest for the trees gives rise to another kind of sign in the woods too – Tree Felling time! Autumn and Winter are the seasons for a lot of woodland maintenance work. 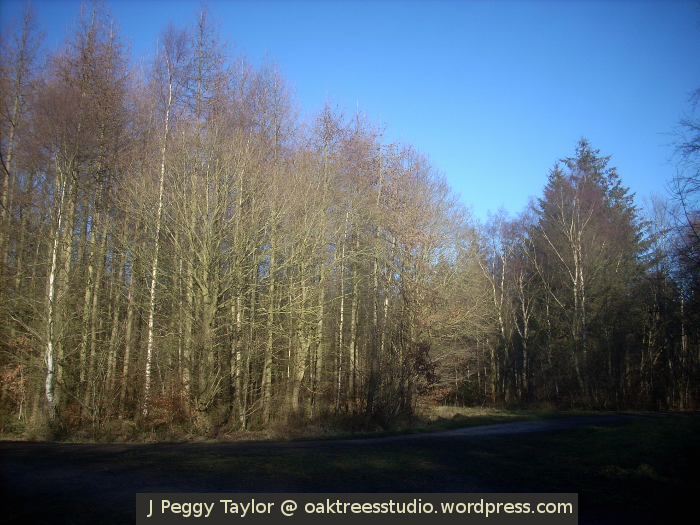 The woodland you see in my images in this post is currently undergoing a restoration plan. The ancient woods that once cloaked our valley have largely disappeared as farmland, villages and commercial forestry took over. There is now a move to try and restore some of the remaining woodlands to their former glory, especially in woods such as this one, where small pockets of the ancient woodland remain. With careful planning it is possible to remove the commercial plantation plantings and facilitate the regrowth of indigenous tree and understorey species. We have already seen how successful this can be in other parts of this wood. 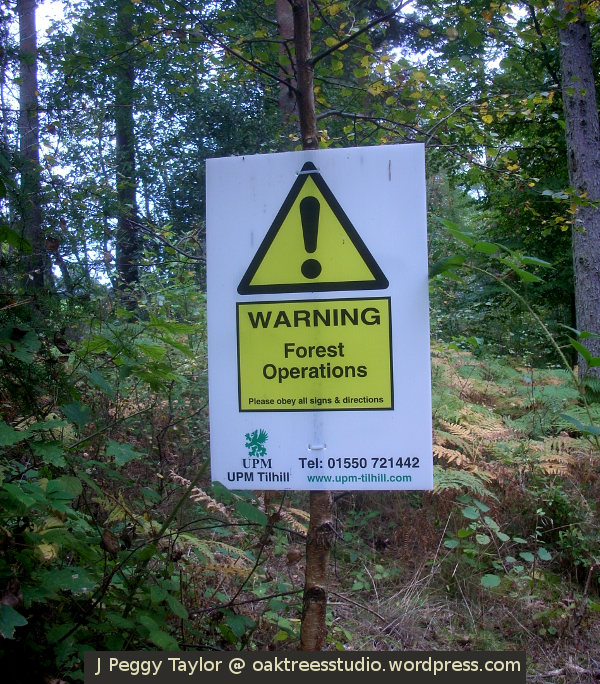 When we visited these woods on Sunday we saw the tree felling signs were in place, ready to remove the fully grown Norway Spruce trees from an area of the wood our children have known as ‘Mirkwood’. If you’re a Tolkein fan, you will recall instantly that dark, dense forest from The Hobbit. So, although we know the restoration of ancient woodland will be wonderful in the long run, it is with a tinge of sadness that we see this part of a childhood play area being felled. Perhaps we can recognise this as a sign of our children growing up too – though I doubt they will ever grow out of building dams in woodland streams or having pine cone battles between the trees! This post links to Cee’s Fun Foto Challenge with the theme of ‘Yellow’ and the WordPress Weekly Photo Challenge with the theme of ‘Signs’. Do take a look at the yellows and signs that others have found for us this week’s challenges. Spring is one of my favourite seasons of the year. It’s the season when everything bursts back into life after a Winter rest. Walking in the woods is a real treat for the senses in Spring as the trees are developing their fresh green leaves and the Springtime flowers begin to bloom. I know I’ve said before, but you can smell ‘green’ in the air! This is a time of renewal, a time for making new plans. Spring is full of promises to be fulfilled. 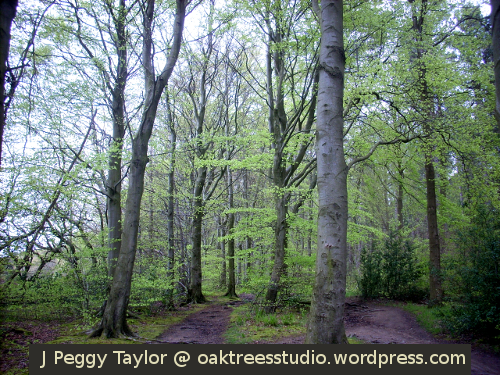 I’ve chosen beechwoods in Spring for Cee’s Wood and Spring Foto Challenge. I love the way the sunlight filters through the the new citrus-green leaves. The bark on this Beech tree really caught my eye. Beech trunks are usually quite smooth and grey – they always remind me of elephants! 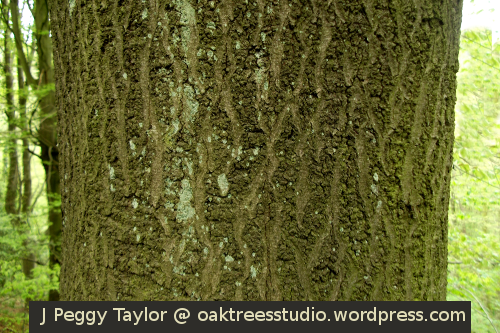 But on some trees, like this one, the bark develops into a network pattern. When it rains the rain runs down in rivulets and the algae on it glows an irridescent green against the dark tree trunk. It’s beautiful to see. Our Summer woodlands are painted with an artist’s palette of wild flowers and greenery. Wherever we walk, our senses are treated to a kaleidoscope of colours and scents. On this occasion our walk took us along a favourite path that is always rather wet and muddy. Either side of the narrow woodland path, the tumble of undergrowth was dotted with the bright pinks of Herb Robert, the purples of Tufted Vetch, the pastel pinks of Dog Roses, the bright yellows of Buttercups, the creamy whites of Honeysuckle and the lofty white umbels of Hogweed. However, this time I decided to seek out some of the less obvious flowers to share with you. This is Brooklime Veronica beccabunga. 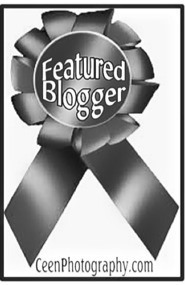 I love that Latin name – I think it sounds like it should be the name of a character in a Roald Dahl story! 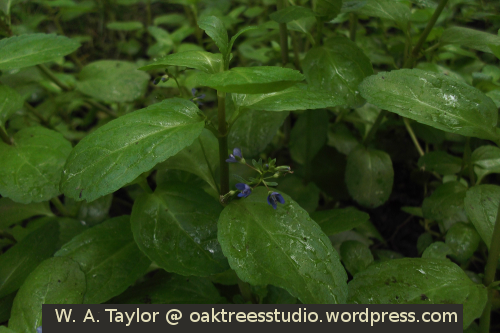 Brooklime belongs to the Speedwell family and has a small bright blue flower with a pale greenish-white centre, fairly typical of Speedwells. 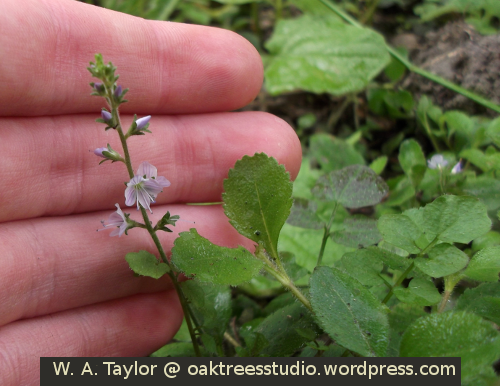 However, unlike other Speedwells it is likely to be the fleshy green oval leaves you’d notice first. The delicate Brooklime flowers grow in pairs from the leaf axils and I always feel look rather small for the size of the leaves. As its name suggests, Brooklime grows in marshy places. Our patch here grows in a very muddy spot and is often part of a puddle. 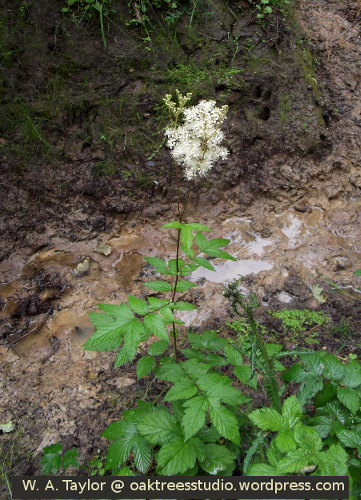 At the next path junction I smelled a tell-tale Summer smell and soon spotted some stems of Meadowsweet Filipendula ulmaria with their fluffy sprays of creamy flowers. It was from these flowers that this distinctive scent was drifting. In some parts of our woods Meadowsweet grows in swathes but here there were only a few stems. They had sprung through a bare patch of earth bank on the side of a drainage ditch, dug as part of some footpath repair work earlier in the year. It will be lovely to see a little colony of these flowers developing along this muddy ditch. 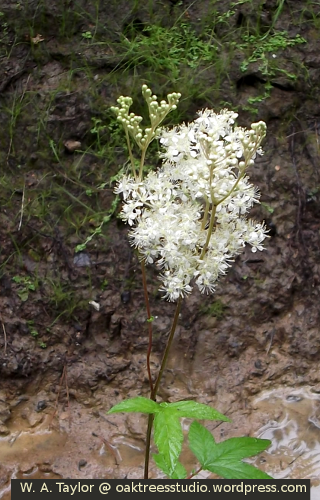 Meadowsweet is another plant that likes to grow in damp and marshy places. 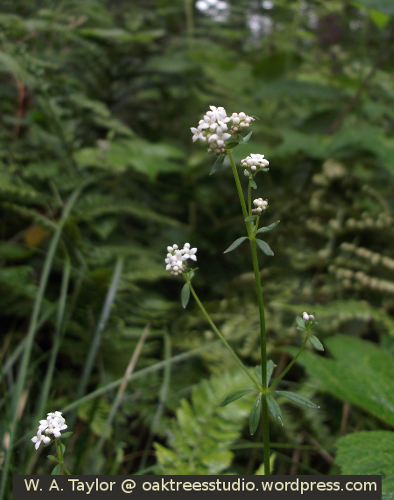 On the other side of the path I spotted some straggling stems of the delicate Common Marsh-Bedstraw Galium palustre, growing through the path-side vegetation. As you’d expect, the ‘Marsh’ in this plant’s name confirms the habitat in which it grows. Similarly to other Bedstraw species, the leaves of Common Marsh-Bedstraw grow in whorls around the stem. Its 4-petalled white flowers grow in small clusters. Unlike some ‘little white flower’ species, the flowers of this Bedstraw are quite sculptured and well-defined. I love the curve of the petals – they look like tiny sugar flowers. Another plant that was re-establishing itself on the side of the drainage ditch was Common Figwort Scrophularia nodosa. This curious flower is another inhabitant of damp woodlands. 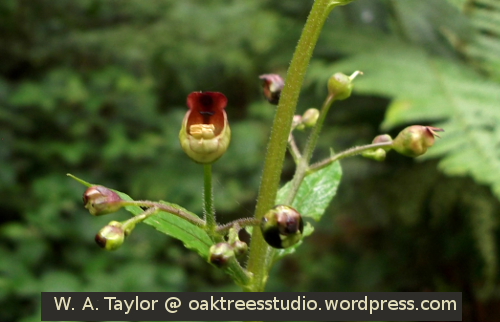 It is unusual in having square stems and Figwort flowers are quite odd too. The flower buds are globular but then the ‘upper lip’ opens like a mouth to reveal its maroon throat and a yellow ‘tongue’! My son said it reminded him of a mini version of the Pitcher plant we’ve seen in botanic gardens. 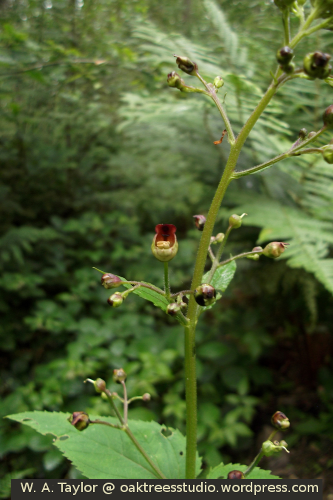 However, unlike the Pitcher plant, I don’t believe Figwort is carnivorous! We see lots of it in our woods, especially along the verges of the wide woodland rides where its moist habitat is often found. Along the path edge I spotted some pale blue spikes of Heath Speedwell Veronica officinalis. 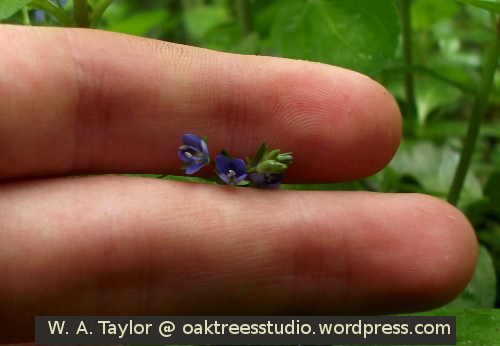 On closer inspection you can see the pale blue flowers of Heath Speedwell also have violet veins running through them. The soft furry leaves are spoon-shaped with a serrated edge. 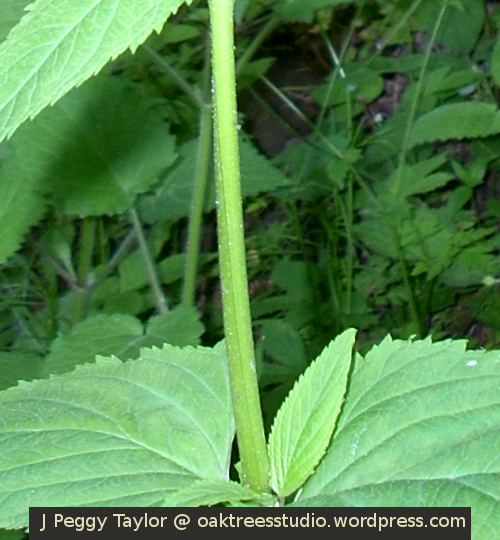 I love the shape of the pale violet flower buds with their protective green sepals. Heath Speedwell is a grassland flower but we often find it along woodland rides too. Just as I was eagerly anticipating in my last post, we haven’t had to wait long to enjoy the carpets of native Bluebells blooming in our local woods. There are certain parts of our woods where the Bluebells really make themselves at home during May. Across the forest floor amongst the feet of beeches, sycamores, rowans and oaks the luxuriant green foliage of Spring flowers provides the backdrop for the beautiful Bluebells themselves. Native UK Bluebells Hyacinthoides non-scripta are a much deeper blue than the Spanish Bluebells. 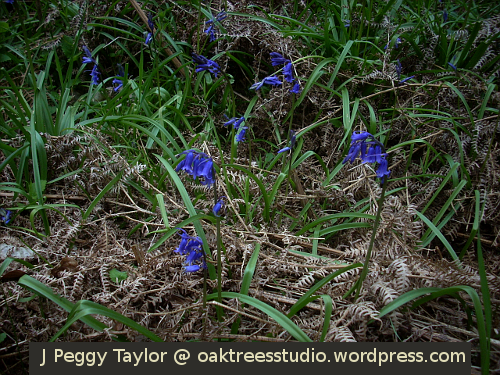 The rich blue sometimes adopts an almost purple hue in the dappled woodland light. 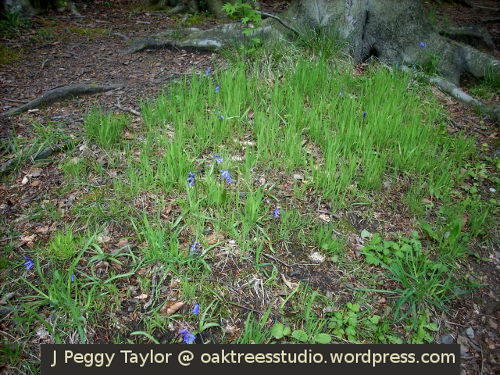 The native Bluebell’s slender stem hooks over to one side, like a shepherd’s crook. The slim blue blooms hang beneath the crook, turning up the points of their petals when the flower fully opens. In our woods Bluebells are joined by the clean whites of Wood Sorrel and Greater Stitchwort, the deeper purple of the Dog Violets and the occasional flamboyant yellow of Dandelions. 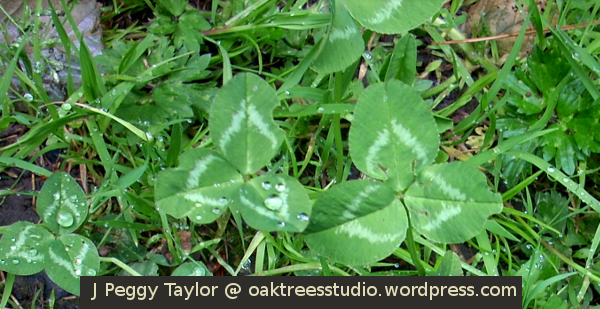 The acid-green of the Wood Sorrel’s fresh trifoliate leaves provide another luminous blast to the woodland floor. 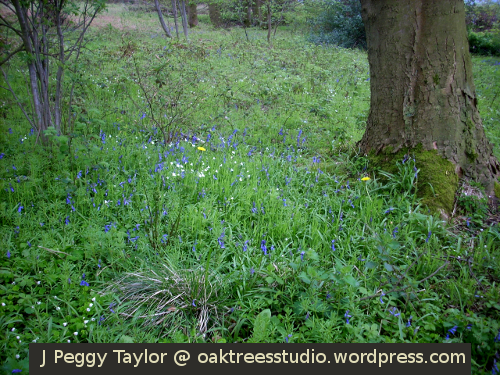 For me, these are the colours that I really associate with Bluebell woods at this time of year. Today we saw Bluebells everywhere we walked. They are certainly one of my favourite flowers and just one of the many reasons that make protecting their endangered ancient woodland habitat here in the UK such an important task. Long may the Bluebells bloom!